This article is about the physicist. For the pro-wrestler, see William Murray Happer. 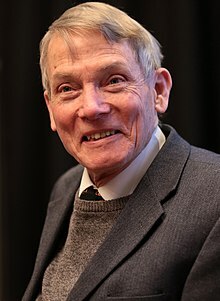 William Happer (born July 27, 1939) is an American physicist who has specialized in the study of atomic physics, optics and spectroscopy. He is the Cyrus Fogg Brackett Professor of Physics, Emeritus, at Princeton University, and a long-term member of the JASON advisory group, where he pioneered the development of adaptive optics. From 1991 to 1993, Happer served as director of the Department of Energy's Office of Science as part of the George H.W. Bush administration. He was dismissed from the Department of Energy in 1993 by Al Gore for his views on the ozone hole. Happer rejects the scientific consensus on climate change. He has no formal training in climate science. Happer was born in Vellore, British India, the son of Dr. William Happer, a Scottish medical officer in the Indian Army, and Dr. Gladys Morgan Happer, a medical missionary for the Lutheran Church of North Carolina. Happer spent the years of World War II with his mother in Oak Ridge, Tennessee. After the war and a return to India, his family emigrated to North Carolina. He studied physics at the University of North Carolina, graduating in 1960. He earned his doctorate at Princeton University in 1964. His academic career started at Columbia University, where he became a full professor and director of the Columbia Radiation Laboratory. In 1980, he left to go to Princeton, where he became Class of 1990 Professor of Physics. In 1991, he joined the United States Department of Energy, where he was the director of its research budget of $3 billion until being dismissed in 1993 for his views on the ozone layer. After his dismissal he returned to his position at Princeton, where he became the chair of the University Research Board in 1995. Happer describes his laboratory's research interests in atomic physics: "we're interested in the mechanisms that limit the performance of optical pumping systems, such as atomic clocks, magnetometers, and laser guide-star adaptive optics systems." Happer joined the JASON advisory group in 1976, and he continues to be active there. Happer is credited with a key insight in 1982 that made adaptive optics possible: there is a layer of sodium in the mesosphere, at around 90 to 100 km of elevation, which could be lit by a laser beam to make an artificial guide star. His idea was tested successfully by DARPA but classified for possible military applications. The military-designed technology was partially unclassified in 1991, after the same idea was independently proposed by two French astronomers. In 1994, Happer and co-authors published a declassified version of the JASON reports on adaptive optics. Happer was chairman of the steering committee for JASON, 1987–1990. Also, he has had numerous other assignments: trustee of the MITRE Corporation, the Richard Lounsbery Foundation and the Marshall Institute. He was also chairman of the last from 2006 until it was disbanded in 2015. He co-founded Magnetic Imaging Technologies Inc. in 1994. Happer disagrees with the scientific consensus on climate change, stating that "Some small fraction of the 1° C warming during the past two centuries must have been due to increasing CO2, which is indeed a greenhouse gas", but argues that "most of the warming has probably been due to natural causes." Michael Oppenheimer said that Happer’s claims are "simply not true" and that the preponderance of evidence and majority of expert opinion points to a strong anthropogenic influence on rising global temperatures. Climate Science Watch published a point-by-point rebuttal to one of Happer’s articles. A petition that he coauthored to change the official position of the American Physical Society to a version that raised doubts about global warming was overwhelmingly rejected by the APS Council. Happer has no formal training as a climate scientist. In May 2013, Happer and Harrison Schmitt published an op-ed in the Wall Street Journal, "In Defense of Carbon Dioxide," in which they termed elevated atmospheric CO2 "a boon to plant life." It was described by Ryan Chittum in the Columbia Journalism Review as "shameful, even for the dismal standards" of the Wall Street Journal editorial page. In 2014, Happer said that the "demonization of carbon dioxide is just like the demonization of the poor Jews under Hitler." In December 2015, Happer was targeted in a sting operation by the environmental activist group Greenpeace. Posing as consultants for a Middle Eastern oil and gas company, they asked Happer to write a report touting the benefits of rising carbon emissions. Happer declined a fee for his work, but when it was urged upon him, he asked that the fee from this work be donated to the "objective evidence" climate-change organization CO2 Coalition, which suggested that he contact the Donors Trust to keep the source of the funds secret as requested by the Greenpeace sting operation. Hiding the sources of funding in this way is lawful under US law. Happer further acknowledged that his report would probably not pass peer-review with a scientific journal. . In 2017 following the election of Donald Trump into office, Happer met with Trump to discuss his potential role of being his science adviser and said that he would take the job if it was offered. Happer described Trump as "very attentive" and that the president's concerns "were that of a technically literate person." Hannah Devlin of The Guardian wrote that Happer "supports a controversial crackdown on the freedom of federal agency scientists to speak out about their findings, arguing that mixed messages... have led to people disregarding all public health information." In early September 2018 it was announced that Happer would be appointed senior director of the National Security Council office for emerging technologies. He is a fellow of the American Physical Society and a member of the National Academy of Sciences. He received a Sloan Research Fellowship in 1967, the Herbert P. Broida Prize in 1997, the Davisson-Germer Prize and the Thomas Alva Edison Patent Award in 2000. In 2003, he was named the Cyrus Fogg Brackett Professor of Physics at Princeton University. Currently, he is a Professor Emeritus. ^ a b "White House readies panel to assess if climate change poses a national security threat". The Washington Post. 2019. ^ W. Happer, G. J. MacDonald, C. E. Max, and F. J. Dyson, "Atmospheric-turbulence compensation by resonant optical backscattering from the sodium layer in the upper atmosphere," J. Opt. Soc. Am. A 11, 263-276 (1994): abstract. ^ Gardner, Timothy (2019-02-20). "White House readies panel to question security risks of climate". www.cnbc.com. Retrieved 2019-02-20. ^ Holmes, Jack (February 21, 2019). "The Head Honcho on Trump's New Climate Change Panel Compared Carbon Dioxide to Jewish People: Both, he said, have been wrongly persecuted". Esquire. Retrieved February 25, 2019. ^ Baynes, Chris (February 21, 2019). "Trump climate change panel set to be led by scientist who compared 'demonisation' of carbon dioxide to Holocaust". The Independent. Retrieved February 25, 2019. ^ Suzanne Goldenberg, "Greenpeace exposes sceptics hired to cast doubt on climate science", The Guardian, December 8, 2015. ^ a b c Hannah Devlin, Trump's likely science adviser calls climate scientists 'glassy-eyed cult', The Guardian, February 15, 2017. ^ Miranda Green (September 4, 2018). "Climate skeptic to join NSC, advise Trump on emerging technologies". The Hill. Retrieved September 5, 2018. President Trump is appointing William Happer, a well-known climate skeptic, to his National Security Council (NSC). ^ "Happer and Ong named to endowed professorships". Princeton Weekly Bulletin. 2003-02-24.